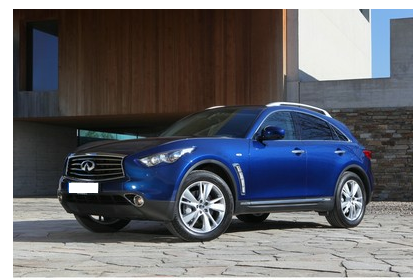 The new Infiniti FX model arrives on the market with a fresh bold look and more distinctive features than ever before. Together with its awesome performance and passionate design, the FX is the height of luxury and is a pinnacle of perfection. The FX for 2012 has street presence in abundance with its brilliantly designed alloy wheels that complement the distinctive new colours perfectly. We can also enjoy a sharp navigation system, an impressive cabin and a pretty comfortable drive. The Infiniti is an intriguing and refreshing innovation loaded with technology to enhance and optimise the driving experience. The 2012 FX range allows buyers to choose from four grades, either to purchase or lease, with the FX 35 AWD being a limited edition model: a trim package with distinctive blue paint and exclusive graphite finish 21 inch wheels. Appearance is head turning. The FX features a revised front grille and fascia design and will, without a doubt, get you noticed. This iconic performance crossover makes a statement and quite simply, has a style of its own. Be part of the in crowd: the Infiniti crowd. If you’re interested in buying or leasing a new vehicle contact our sales team. Alternatively,visit our website where you will find new and used Infiniti’s available for sale or on finance.